Ever since my first encounter with Thymes at the New York International Gift Fair last fall, they have become one of my favorite bath & body care brands. 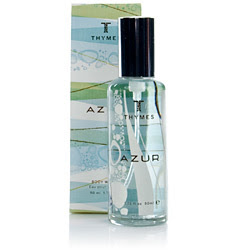 My favorite Thymes collections are Azur and Red Chérie. Azur is a scent that I was not familiar with and recently tried for the first time. I love the marine fragrance of soothing white tea, water lily and sea grasses. I've been using the body water ($32), a lightly scented cologne that lasts all day. The scent reminds me of the ocean, which is why I think it's the perfect scent for summer. The Red Chérie fragrance is a mixture of red fruits and flowers, pomegranate, ripe red cherries, passion flower and jasmine, with a twist of lychee and fruity musk. I recently tried the hand lotion and loved it! It has a light, sweet scent and moisturizes your hands without feeling too thick or oily. If you love this fragrance, you'll love all the other products that are offered, like the Red Chérie body wash ($18), cologne ($32), sugar body scrub ($28). 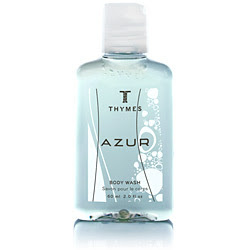 I am excited that Thymes now offers travel size (2 fl oz / 60 ml) body wash and body lotion ($6 each), so next time I take a trip I can bring my Azur or Red Chérie products with me! They would also make great stocking stuffers for the holidays!